Stuck between the flower power of the sixties and the business power of the eighties, the seventies were a time of transition. 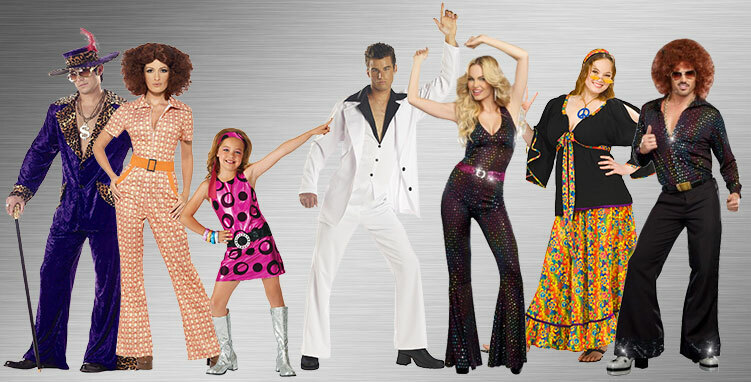 With this collection of 70's Costumes, you and your kids can get wild styles that are great for heading to wild costume parties, going trick-or-treating around the neighborhood, and much more! Let your inhibitions go and dance among the wildflowers like a true free spirit. From tie-dye to VW buses, numerous iconic images mark this groovy decade. 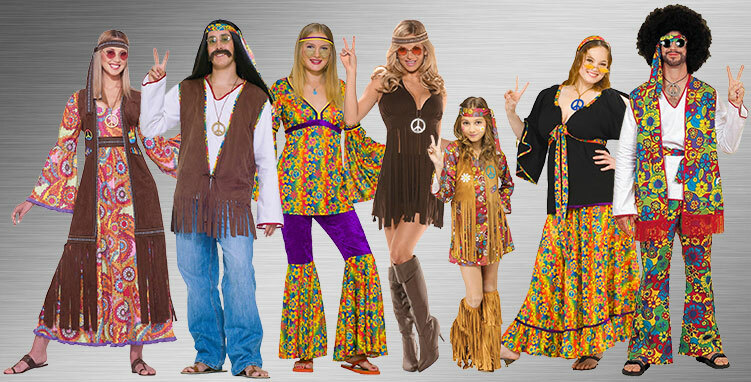 You don't need to have been a hippie in the past to dress up like one for your next costume party. If you want to boogie on down during the festivities, this is the perfect costume for you. Whether it is the music, culture or political activism that draws you to the decade, you will feel confident and free in the various costumes that pay homage to this wild and wonderful era. Get funky when the sun goes down and show the floor your best moves. Whether you have a dancing partner or you are flying solo, this is the best look to rock on the dance floor. The disco ball will be shining bright above you for all to see. 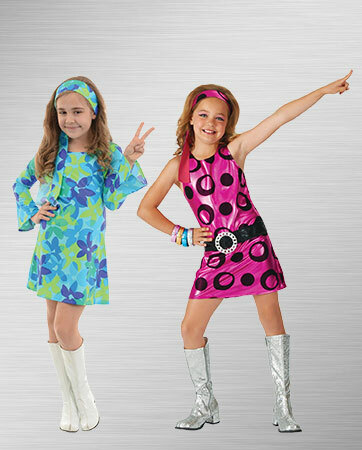 Spin around and strike a pose with this groovy disco costume. From head to toe, you will fit the foxiest looks of the era. Everyone will know you love to have a good time with your fun-loving style and boogie moves. You can’t take on the disco 24 hours a day. Pay homage to the quieter times of the day with this far-out costume for all the foxy ladies in the house. With big hair and a big spirit, you will look right on. The living is easy in this classic 1970s leisure suit get-up. The vibrant colors and funky fabrics of the decade will make you stand out. Mix a little bit of Rico Suave with Disco Dan and you get this fresh look that will light up any costume party you attend. This laid-back costume doesn’t take a whole lot of effort to rock. Just put on your fun-loving attitude and you will be good to go. Listen to some good tunes with good friends and chill out. Your peaceful demeanor will be the perfect complement to this fringe vest. Use that flower power to give everyone at the party the best night of their lives. 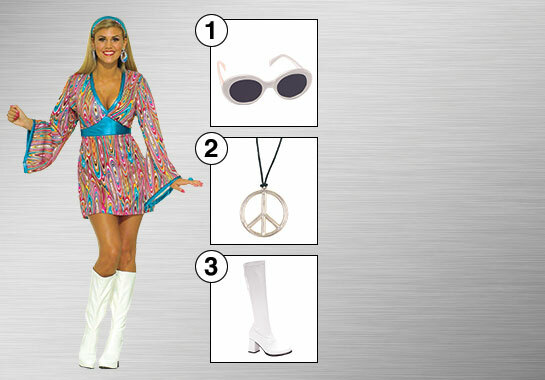 With your bright smile and glowing aura, this fun-loving hippie costume will be the perfect fit. You will be cool, confident and free to be you. Be the face of the decade of change with this stellar get-up. Tease out your hair out and grow your best moustache to get the full, funky effect. This costume will look great whether you lived through the 70s or you simply want to live vicariously through those who did. Can you dig it? Get ready to dance the night away in this seductive Go Go Dancer costume. Your costume will be bright, but your moves will really steal the show. Whether you are getting down with Foxy Brown or entertaining the crowds, you will certainly be the life of the party in this get-up. Roll with your tribe wherever you go and you will have the best night of your life. When you get all dressed up and allow yourself to follow the free-spirited, barefoot, tree-hugging nature within you, you will be able to enjoy each moment for what it is. No more fighting, no more hate. Just peace, love and good old rock and roll. The whole family can get in on the action or you can grab all of your friends and get down. With so many accessories to choose from, you can make each costume unique no matter how many people you have with you. Love and family are two of the most important things in life. 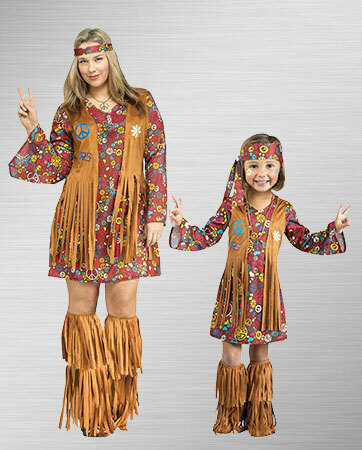 Stay true to your loving nature with this flower-power inspired mother and daughter costume. The apple doesn’t fall far from the tree with your loving kindness and undeniable beauty. Show your funky side and dance away your worries with all of your best friends. Nothing is more fun than getting all dressed up and turning up some of your favorite tunes. Learn some of the disco moves and boogie all night long! A few iconic accessories are staples of the 70s. All of the hippest girls were either down with the mod Go Go girl look or they stayed true to Mother Earth with a free-spirit style. Both looks were equally popular and both are equally easy to replicate with the right accessories. 1. Mod White Sunglasses - Shield your pretty little peepers from your bright future with these hip sunglasses. The bold white frames were the look of the generation. 2. Peace Pendant Necklace - You may wear your heart on your sleeve, but put your peace around you neck. 3. White Gogo Boots - In order to dance all night long, you need the right shoes. Bust a move with these go go boots and draw attention to your fancy footwork.